French guitarist Benoit Viellefon brings his Hot Club Orchestra back to Cardiff on Friday 20 July 2012 for a free gig in the foyer of the Wales Millennium Centre at 6.30pm. 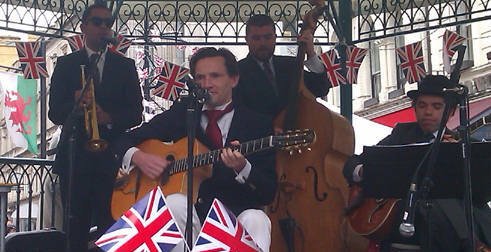 Benoit and co recently took part in the city's Diamond Jubilee celebrations as part of the line-up of live music on an outdoor stage in St Mary Street (as pictured above). He'll be promoting his new limited edition CD Live at the Quecumbar - Benoit delivers a distinctive take on the Hot Club/gypsy jazz style with accordion and brass adding a rich, Balkanesque flavour to the mix. The live CD features a guest appearance by Cardiff's very own Arthur Foxaque.